백석의 해방 전 행적에서 사회주의 이념과의 연관성을 확인하기는 어렵지만 분단 후 그는 사회주의 국가 북한에서 많은 번역 작품과 동시, 시, 문학론을 남겼다. 이 논문은 백석이 사회주의, 사회주의 문학을 어떻게 인식했는지를 살피는 것이 목표이다. 백석이 활동한 1962년까지 북한 문학계의 변화에 따른 백석 문학의 변화를 살폈다. 1950년대 중반까지 백석은 당 문예정책에 따라 다수의 소련 문학을 번역했고, 1950년대 중반에는 기존의 도식주의를 비판하던 북한문학계의 변화에 힘입어 자신만의 문학성과 예술성을 주장하는 평론과 시, 동시를 활발히 발표했다. 이로 인해 문학적 숙청을 당한 1959년 이후부터 1962년까지 그는 철저히 북한 문예당국의 요구에 응하는 작품을 써냈다. 백석은 사회주의를 인간의 도덕과 예의로 이해했으며 공산주의 사회를 품성을 갖춘 인간의 공동체로 인식했고, 사회주의 문학과 작가의 역할은 대중을 위로하는 예술의 창작에 있다고 믿었다. 작가의 역할을 대중을 위로하는 예술의 힘으로 믿었다. 이는 인민성, 당성, 계급성에 입각한 작품으로 인민대중을 교양하는 공산주의 투사로써 시대에 맞는 전형을 창조해내야하는 북한 작가의 의무와 역할과는 거리가 있었다. 문예당국의 요구에 맞는 작품을 쓴 시기에도 좁혀지지 않은 그 거리는 시인과 대상의 거리감으로 드러났다. 조선 문단 최고 서정시인 백석이 사회주의 체제에서 가진 사회주의와 사회주의 문학에 대한 인식과 그의 작품은 당시 북한 문학의 목표와는 유리되어 있었다. This study aims to investigate the consciousness and processes of Baek Seok, a Korean poet, as to why he was engaged in North Korean literary circles after the liberation of the Korean peninsula. Before the division of Korea, Baek Seok’s work had been typified by lyrical and folksy poems devoid of any mention of socialism. However, after liberation, he chose to reside in North Korea and translate novels, children``s poems, and stories that emphasized a friendly relationship with the Soviet Union, while he highlighted the role of socialist children’s literature through his work as an author of children’s books. After the 1960s, Baek Seok started creating poems that glorified the North Korean regime. This fact has been treated as a hidden side of the author and has never been studied in depth. 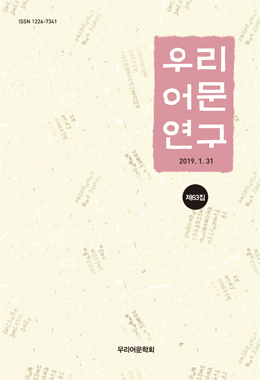 The present study examines Baek Seok’s attempts to comprehend and realize socialism through his prose and theories of literature and translation. In his poems and children’s stories, Baek Seok focuses on emotion and literary embodiment, and emphasizes language and forms as criteria when selecting poems for translation works. This demonstrates the poet’s genuine philosophy to put literary value over ideology in literature. This study also finds that the communism in which Baek Seok believed is depicted and idealized in his poems and prose. He describes socialism as a society where polite, well-mannered and ethical people live together in a beautiful community of citizens. However, his understanding of socialism shows a great disparity from the literary circles in North Korea that had eventually expelled him in the late 1950s. Although the precise reasons why Baek Seok chose North Korea as his subject matter cannot be confirmed, it is clear that he had illusions about an abstract and ideological socialism, and that these views were not tolerated by the North Korean literary circle. Providing evidence for this conclusion can be a critical element in understanding Baek Soek’s poetic oeuvre.